Blissfull ATC Swap for March! in any way that we wanted to. ATC that she has ever made!! I love her she is adorable!! Tina also gave me a crochet Tea towel and some Tea bags too!! Look here do you see the pincushion.. it has Dragonflies on it that I love so much! How did she know? 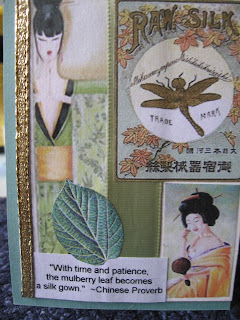 This is the ATC I made for Tina! What is that Blue thing on it you ask?? for Tina. Thank you so much Tina!!! !